The rack and pinion design of PowerRac® Actuators provides high-operating torque for accurate control in modulating services, and high opening torque for on/off services. The unique square collet coupling rigidly clamps the drive pinion to the valve shaft, eliminating backlash in the drive connection. Positioners are solidly mounted on the actuator housing with a square nut, feeding exact valve position directly to the positioner. The modular design and compact size allow the actuator to be close coupled to the valve. Standard ISO bolt circle allows PowerRac® Actuators to be used on all DeZURIK quarter turn valves. Double-acting or fail-safe spring-return cylinder options are available. Positioners are solidly mounted on the actuator housing with a square nut, feeding exact valve position directly to the positioner. No lost motion assures accurate valve positioning. A standardized accessory rack allows easy mounting of other commonly used accessories including position indicating switches, potentiometers, air filter regulators, and solenoid valves. 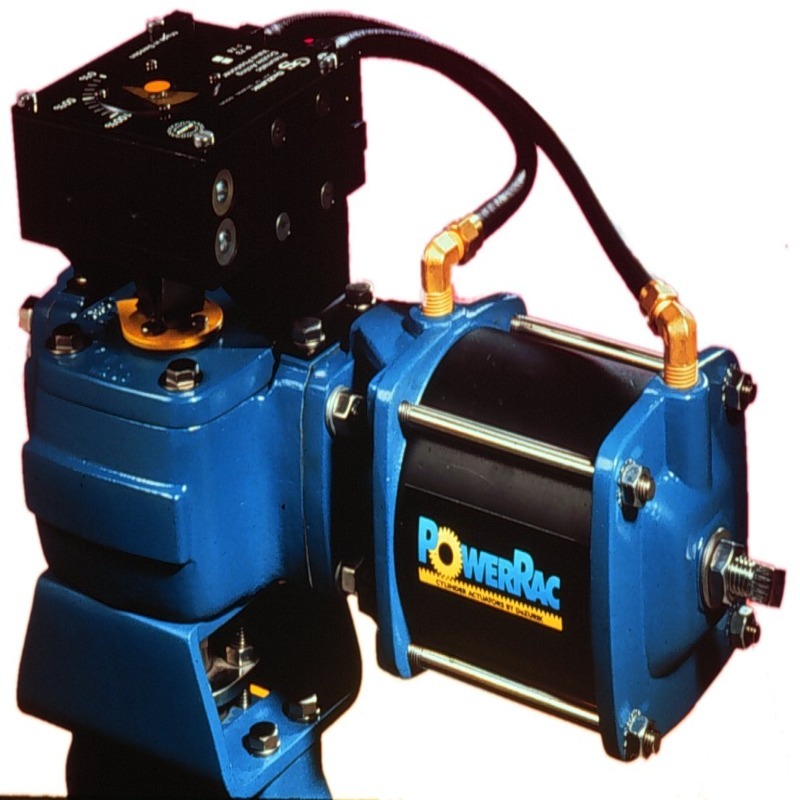 As an option, PowerRac® Actuators are available with a throttling manual override, allowing valve operation in case of system or supply failure. Three actuator sizes allow PowerRac® Actuators to be used on valves from 1 - 24"* (25-600mm*).